Children's x-small through x-large, to fit foot lenght up to approximately 5"-9". 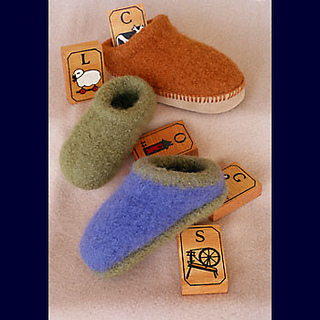 Also available in adult sizes: Felt Clogs AC-33. 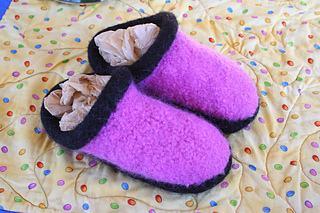 Fast and easy felt clog slippers for children. Knit with double yarn and designed to be felted to a very thick, firm fabric. They feature double soles for extra comfort and longer wear. 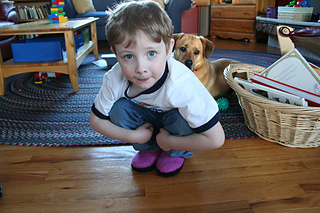 Join soles with a "bumper" as shown on the 2-color clogs, or with a plain join as shown on the solid colored clogs. Sizes: Children’s x-small, small, medium, large, x-large. To fit foot length up to approximately 5" (6", 7", 8", 9"). Actual size is achieved during felting so you can customize the fit for sizes between these lengths. Yarn Requirements: Clogs are knit with a double strand of heavy worsted weight wool. Yardage: The following yardage allows for yarn to be held double throughout. Approximately 210 (245, 285, 335, 355) yards per pair. 2-colored slippers with a bumper will require approximately 145 (175, 185, 225, 240) yds of sole/cuff color and 65 (70, 90, 100, 115) of upper color. Needles: Size US 13 circular or straight.